JUICING OR SMOOTHIES – WHICH IS BETTER FOR YOU? There is a machine that extracts the juice when you do Juicing. What happens is the water and most of the nutrients from the produce are left behind in the pulp. When blending there is no leftover pulp. Blenders pulverize the whole produce to make a Smoothie. When you Juice you are removing the insoluble fiber. Fiber is good for you to keep your digestive tract healthy and slows down the absorption of sugar. It also slows down the absorption of nutrients and some nutrients stay in the fiber. When you Juice you are extracting up to 70% of the nutrients right into your glass, and without insoluble fiber your body absorbs 100% of the nutrients. 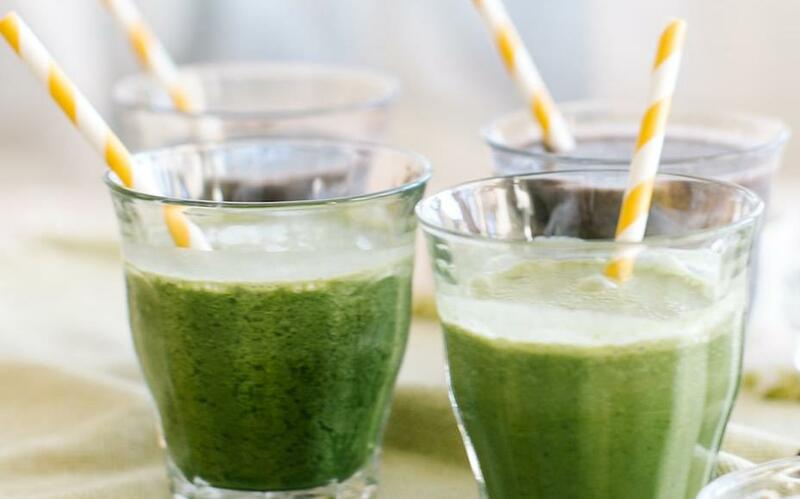 When you do Smoothies you get the important fiber that balances sugars but you might lose some nutrients in the fiber which you absorb in the digestive tract any way. It is always best to drink green Juices or Smoothies, because to many fruits add a higher amount of sugar intake. The best fruit choices are berries because they are high in antioxidants. Also best to get organic when you can, especially Strawberries because next to apples they use the most chemical pesticides. Also test results have proven you always get more nutrient rich foods with Organic produce. When using vegetables and fruits it is always best to get fresh and you can always freeze them, to use in the winter or even just to preserve them longer for daily use. Be cautious when buying frozen bag fruits because there was a case this year that a large store had a call back of a particular brand of mixed berries you could get hepatitis from them. Make sure you always wash your fruit and vegetables first with a fruit & veggie wash to clean residue and get rid of parasites . Avoid using bananas because they are high in sugars and they contribute to stomach fats more that most fruits. When it comes to drinking fruit Juices from the store they are no better for you than drinking a sugary drink. When making a Smoothie as a meal replacement you can add Protein Powder. I prefer Vegetarian because Whey doesn’t digest well for me, but which ever you decide to purchase, make sure you read the label for best natural ingredients. You can find some great Smoothie recipes that use Avocado as the protein too. Try to stay away from milk and yogurt because they cause more inflammation in the body. You can use almond or coconut milk to replace milk and a powdered probiotic instead of yogurt for friendly bacteria. I use part coconut water, for the electrolytes, and part water. A whole food hasn’t been processed at all. In nature fruits and vegetables are perfect whole foods because they contain one ingredient (especially organic) themselves. Eating more fruits (non Acidic) and vegetables (especially more dark greens) is the foundation stone of a healthy diet. The down side of drinking fruits and vegetables compared to eating them is the loss of fiber,extra sugars and loss of other nutrients found in skin and pulp. When we chew our food such as vegetables, fruits, nuts, seeds,sprouts etc., we chew it to break it down into smaller sizes in order to swallow it. However there is more to it than that because when we chew the food we are covering it with saliva, which contains an enzyme called Ptyalin, that helps to break down the food for the digestion process. If we skip chewing our food because we are consuming it in a form of either a Smoothie or Juice then we are also giving it to our digestive system with out the necessary enzyme to help digest it. This enzymes helps to digest carbohydrates and begins that process in the mouth. Not only that, but when chewing your food you are burning calories that help to give your body energy, plus it keeps your body active and moving.